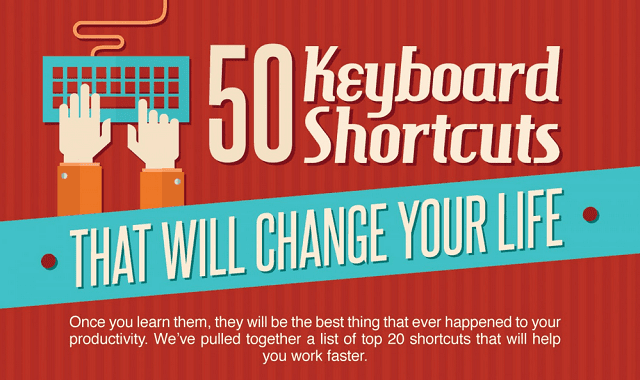 50 Keyboard Shortcuts Which Will Change Your Life #infographic ~ Visualistan '+g+"
It was just like a blink of an eye when we woke up from a silent place then ranges to the busy streets. Yes, it never was a dream that you rise up with the fast-paced technology around you. We can never deny the fact that we are already conquered by the easy ways of doing things and we become so ancient and obsolete if we do not jump in to what’s the new trend. Let’s face it. It is more than a great convenience when we finish and accomplish tasks in an instant. The very much common model is the use of computers. Undeniably true, it keeps documents without even making it so hard to save them. It communicates us with other people. And most especially, this becomes the source of livelihood for others --- working with it. But, not everyone is given the special chance of scrutinizing the softwares and the hardwares that makes it up. The skill to somehow even make your tasks easier on the use of computers is not really being enhanced. So, how do you come up with improvements to a speedy accomplishments of computer jobs? Simple. Study on the keyboard shortcuts. Yes, shortcuts. This is no difference with having a road shortcut for easy access. With this infographic, you will be guided with how to go about simplifying your typing works and searching modes. This classifies whatever operating system, browser or programs you have so you could just simply choose whichever applies to your use. This does not only provide you with your own convenience, but also to others if you share it. So, for this time, make it a practice and a habit. Do the task and take a cheat for once on the guide. Eventually, you would be able to familiarize them the moment you get used to. If you do so, teach someone the same way to help him or her out and share the similar guide. Otherwise, what use could it be if you know of something then you would not share it to others? Be smart and wise.